Despite the government’s best intentions, Bagmati may never become the pristine river it once was. Madhukar Upadhyay, like many who grew up in the 70s and 80s, recalls swimming in the Bagmati as a child. The waters were pristine then, as translucent as glass, with fish abounding. “My dad’s generation even used Bagmati’s water for drinking, after only a quick decantation process,” he says. Today, swimming in the Bagmati, let alone drinking its waters, is unimaginable. Despite being little more than a sewer, the 597 km long Bagmati remains one of the most important, and most revered, rivers in the country. Up in the Shivapuri-Nagarjun hills, where it flows out of a lion-headed spout, the waters are still crystalline. But as it flows through the forests and down through Sundarijal, the river turns sluggish, and its path becomes one of increasing degradation. “As of now, the Bagmati is dead,” says Upadhyay, who has been working in the field of watershed management for the past three decades. The Bagmati has paid the price for Kathmandu’s path to prosperity. Factories, industries and homesteads have all dumped their waste into the river, treating it more like an open sewer than a holy river. Along with heavy industrial activity, experts point to haphazard urbanisation, rampant sand extraction, increasing solid-waste dumping, lack of public awareness, gross government negligence and weak policies for destroying the very river that gave birth to the Valley. But for the past decade or so, the government’s efforts towards giving ‘life’ back to the Bagmati have been gaining momentum. It has the finances and a fully-formulated action plan. As with everything else in this country, the question remains whether the government can pull it off. But the larger, and more important, question that few seem to be asking is whether the Bagmati can even be cleaned. The Bagmati has reached a point of no return, says Upadhyay. In many ways, we have lost it forever. How dirty is the river really? Rivers make cities. In ancient times, major cities were often built around a sacred network of complex river systems. Some of the most advanced civilisations in the world originated and flourished on the banks of rivers. The Kathmandu Valley civilisation, too, sprung up on the banks of the Bagmati River, as was the late agricultural scientist and Bagmati River activist Huta Ram Baidya’s contention. The Bagmati that gave rise to what Baidya called the ‘Bagmati River Civilisation’ is no more. Everything changed when Kathmandu transformed from a sleepy mid-sized town to a metropolis. As Kathmandu’s population increased, pollution too began to rise. The first symptoms of pollution in the river were seen in the 80s, when carpet industries started mushrooming in Jorpati and shreds of wool could be seen floating in the waters, says Upadhyay. Then, it was only a matter of time. As industries began to proliferate, waste was dumped into the nearest large river, which often happened to be the Bagmati. Regulations forbidding the dumping of industrial waste into rivers were late in coming and even when they were drafted (in 2011, with the implementation of the Solid Waste Management Act), they were largely ignored. The slow choking death of the Bagmati had begun. The Bagmati river is a deeply integrated system of seven tributaries—Bagmati, Bishnumati, Dhobikhola, Manohara, Nakkhu, Balkhu and Tukucha—and five sub-tributaries—Godavari, Hanumante, Sangla, Mahadev and Kodku Khola. Today, the river is nothing more than a heavily industrialised, foul-smelling drain, and its ecology has been changed beyond recognition and modified beyond repair. “What you see in the river is not water, it’s just sewage,” says Deep Narayan Shah, a natural resource management specialist. The Nepal River Conservation Trust, a non-profit organisation established by a group of river conservationists, reported in 2015 that the Bagmati’s water (from 15km to 160km) was unsuitable for drinking and for irrigation, it does not meet the requirements for aquatic life, and it exceeds the maximum permissible levels for effluent discharge. Nepal’s water guidelines state that water for drinking, irrigation and recreation should be at a pH level between 6.5 and 8.5, but on many stretches of the river, the pH exceeds 9, according to the Bagmati Expedition Report. The water also contained high concentrations of ammonia, nitrate, total dissolved solids, phosphate, iron, arsenic, mercury, etc, making it uninhabitable and ecologically dead. 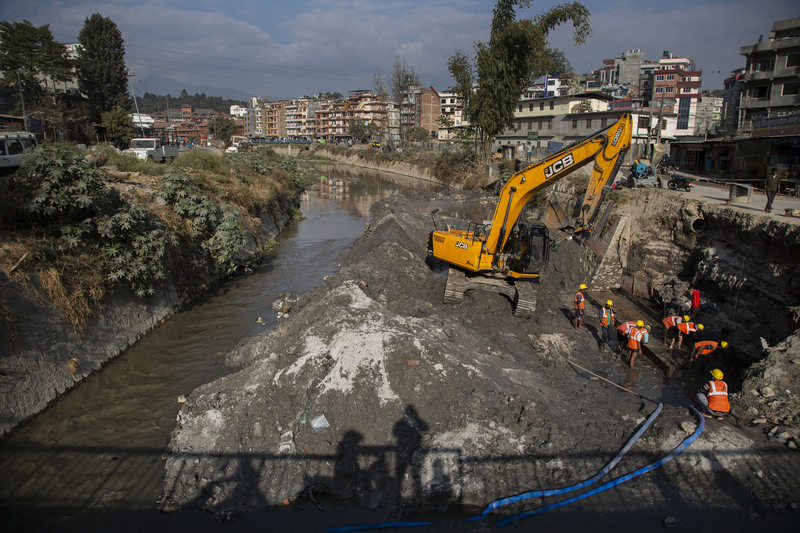 To reverse all the damage we have inflicted on the Bagmati is a gargantuan task, say experts. “The Bagmati is a product of nature and we have changed its natural environment,” says Upadhyay. There are a few key things that need to be addressed if we were to ever ‘restore’ Bagmati to its original state. First is the river’s decreasing watershed, which is an area of land that feeds all the water running under the surface, and draining off it, into a body of water. Rivers like Bagmati are a result of a network of watersheds and streams. “The watershed for the Bagmati River has significantly decreased because of urban sprawl,” says Upadhyay. “We have also sealed almost all rechargeable areas with concrete, making it impossible for rainwater to seep into the ground. The only forests that are left are also on the ridges of the valley.” This is why the Bagmati runs dry almost all year round, except during the monsoon when it is inflated with surface run-off rainwater. Because the river does not recharge naturally, it is unable to flush out toxins on its own. Rivers with a regular flow of water all year round are able to cleanse themselves, but without water, all the toxins settle down on the riverbed, which in itself is another problem. Sand on the riverbed is vital to filtering the river’s water and making it suitable for the flourishing of aquatic flora and fauna. 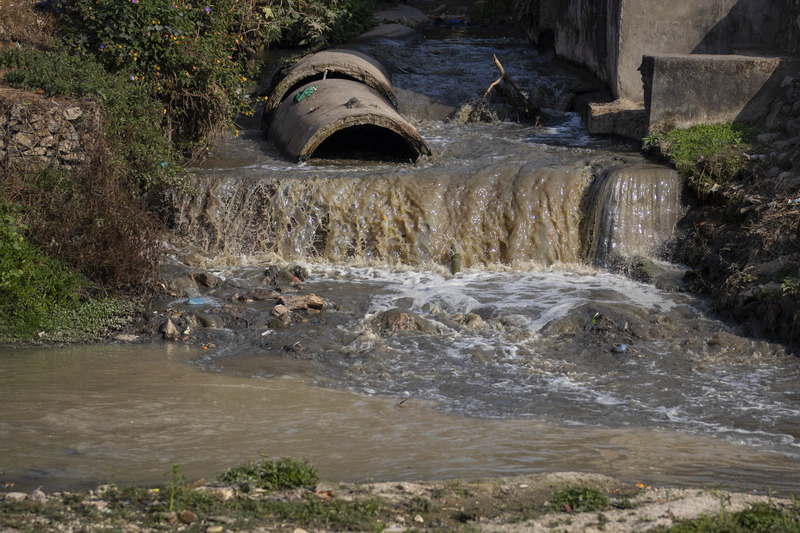 But in Bagmati, this process does not take place, as a layer of organic and inorganic discharge has accumulated on the bed, sealing off access to the little sand that still exists. Furthermore, over the years, sand on the riverbed has been smuggled away by the ‘sand mafia’, a shadowy network of operators who illegally mine the Valley’s riverbeds. The sand is then sold off to construction companies. 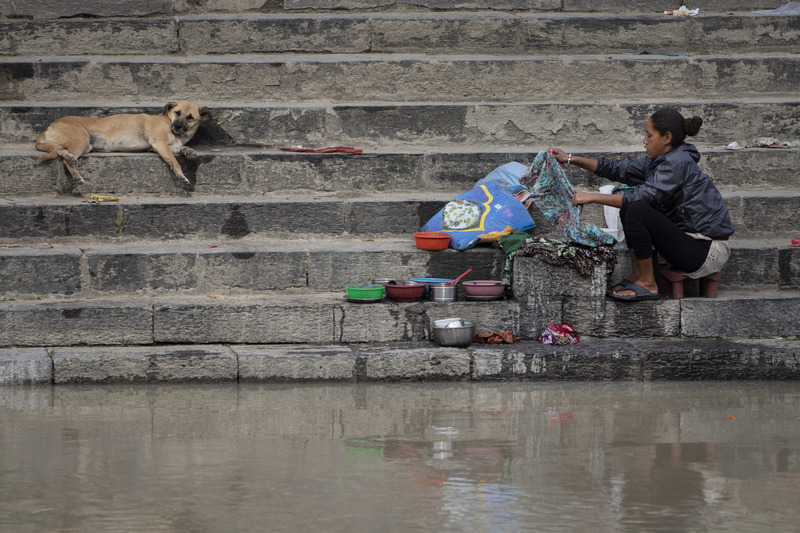 “To be honest, we have no idea what the floor of the Bagmati even looks like,” says Upadhyay. While there are reasons to believe that we have destroyed the Bagmati well beyond natural repair, there are anthropogenic means at our disposal that could help clean the river. The Nepal government has been trying to use these methods to clean up the Bagmati for over a decade now, but with little success. Every attempt has been undone by corruption and a certain level of apathy. Back in 2009, the government had come up with the Bagmati Action Plan, led by the High Powered Committee for Integrated Development of Bagmati Civilisation, in collaboration with the Nepal River Conservation Trust, with the objective of “restoring” the degraded Bagmati River. The Action Plan had been formed with a vision of “a clean, green and healthy river system that is full of life and valued by all”, but while some interventions were implemented, many were not. Today, the High Powered Committee, the government body leading the initiative to clean the Bagmati, has new plans in order. One of its primary tasks is the construction of interceptor sewer pipes along both banks on the main stem of the Bagmati, from Jorpati to Balkhu. The goal is to construct 91.84 km of pipes, of which 60.33 percent is already complete, according to the Bagmati Bulletin, a publication of the High Powered Committee. However, construction works on the remaining Bagmati tributaries are incomplete. The government’s second step is to construct wastewater treatment plants. For this, in addition to the Guheshwori wastewater treatment plant, which is the only functioning plant in the country, five others are currently being constructed. All of them will be completed in a span of three years, says Yogendra Chitrakar, Deputy Project Manager for the High Powered Committee. The new plants will be constructed at Sallaghari, Balkumari, Dhobighat, Gokarna and Hanuman Ghat. The construction of three plants—Sallaghari, Balkumari, Dhobighat—are being carried out by Kathmandu Upatyaka Khanepani Limited (KUKL), but the construction of plants at Hanumante and Manohara is going to be financed by the Asian Development Bank (ADB). Considering the amount of power these plants will need to run, the government plans to conduct them with renewable energy, with 70 percent of the power coming from methane gas, a laudable goal if implemented. “After sewer pipes are laid, they have to be linked to all the pipes that come in from the municipalities,” says Rajesh Singh, ex-member secretary for the High Powered Committee. After the pipes are all connected, and the wastewater treated, the clean water will then be pumped into the river and waste will be directed out of the Valley to another plant in Chobar. different parts of the Valley. Alongside all this, there are many grassroots efforts being made to clean the Bagmati, such as the Bagmati River Festival and the Bagmati River Expedition. One of the longest running campaigns, however, is the weekly cleaning campaign, the Bagmati Safai Maha Abhiyan, initiated in 2013 by Leela Mani Paudyal, the then chief secretary. Every week, the campaign fishes out tonnes of plastic and other inorganic waste from the river. And while the campaign is commendable, for it does create a lot of awareness, the task is Sisyphean. The amount of plastic pieces that flow in the river is immense. Between only 5 km and 65 km of the Bagmati, an average of 1,046,856 pieces of plastic float daily, according to the 2015 Bagmati Expedition Report. “This effort is not enough to clean the river,” says Shah. The Bagmati’s water is supplied by rainwater and groundwater. During the monsoon, the Bagmati swells in volume, but as soon as winter sets in, the river runs almost dry. In order to ensure that water is available in the river all year (to help flush out toxins), the water level must be regulated. “To do that, we are building storage tanks up in the hills. During the monsoon, we are going to trap water in the dam and when the dry season starts, we will release the water to ensure there is enough flow in the river,” says Chitrakar. The High Powered Committee is currently building a dam 24m tall at Dhap, in Shivapuri, which will be completed by June. Another, much bigger dam, with a height of 102m in Nagmati, Shivapuri, will be constructed in five years’ time. “We are hopeful that the ecology of the river will improve this way,” says Chitrakar. But even the former member secretary agrees that a lot of political will and coordination is required to bring all these efforts to fruit. “Maintaining all these different aspects will take a lot of work and a lot of coordination from all parties involved,” says Singh. Just like how the linking of the sewer pipes to the main pipes is the responsibility of the municipalities, it is the responsibility of KUKL, which will be taking the lead on the construction of the wastewater treatment plants, to take care of all the maintenance work of the plants for the next 10 years. Will the government be able to pull it off? While all these plans are noble and well intended, they will require a lot of time, effort, and money on the government’s part to actually pull off something of this scale. “If even one of the components does not work in equilibrium, the rest will falter,” says Upadhyay. However, there are other logistical challenges that still haven’t been taken into account. For example, the volume of wastewater that comes in daily. “We do not know how much wastewater actually goes into the Bagmati,” says Shah. Currently, in the Kathmandu Valley, people use two sources to address their water woes: direct water lines that are provided by the KUKL, and groundwater, which experts say makes up for almost 50 percent of the demand. However, because there is no monitoring body in place, we don’t know for sure how much groundwater is being extracted from aquifers on a daily basis. And when water from Melamchi finally arrives, the numbers will change yet again. Will the Bagmati ever go back to the way it was? It is not that major city rivers have never been cleaned. One good example is the Thames river in London. Despite also being declared biologically dead, the river was brought back to life in 50 years, becoming one of the greatest environmental success stories in urban history. Experts, however, say that our case is very different from that of the Thames. “The Thames is a big river. It had the volume needed to naturally cleanse itself. More importantly, it had a government that had the means to do its job competently,” says Upadhyay. As of now, the Nepal government is positive that their efforts in reviving the holy river will come to fruition, and that the water in Bagmati will once again be ‘clean’. However, Bagmati experts question the government’s definition of ‘clean’. Excessive human intervention has always disrupted ecosystems and tipped nature’s balance. What we have done to the Bagmati is just a reflection of our own sense of morality. “Knowing that we have pushed nature beyond regeneration should push us to take better care of the resources that we have,” says Upadhyay. The Bagmati continues to be used for household tasks lke washing dishes and clothes, as seen at Gaurighat. Sewers like this one at Pashupati empty tonnes of household and industrial waste into the ‘holy’ river.